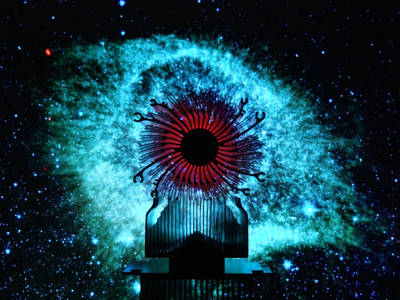 Architecture with Helix Nebula backdrop. Stack of heat-sinks (from Enviro-Green Recycling Services) in front of my computer monitor showing astronomy photographs (APOD). Helix Nebula image credit: NASA, JPL-Caltech, Kate Su (Steward Obs., U. Arizona), et al. *Sometimes an eye is just an eye.